The dividing line between rock ‘n’ roll in its earliest days and the closely related music which immediately preceded it may be a thin one at times but it’s fairly easily seen. Though we can grant credit to the likes of Louis Jordan, Roy Milton and Bull Moose Jackson for being rock forefathers their separation from rock ‘n’ roll itself is evident upon first listen without us needing to explain their absence. They simply weren’t rockers, had no desire or need to be considered rock, and their audience wasn’t part of the rock generation. Each of them, the artists and their fans alike, remained firmly on the other side of the generational and musical divide. It wasn’t just the construction of their bands and the arrangements they adhered to which set them apart, but it was also their mindsets. They were aiming to be successful in a market whose tastes were already well-established and which pre-dated rock entirely and while there’s always going to be some spillover among stylistic constituencies within the larger music scene, the two camps had decidedly different expectations which determined their interests. The sad thing isn’t that we’re not including them here, where they pointedly don’t belong, but rather that they generally aren’t included ANYWHERE in the major genre histories because they fell into a no-mans land of stylistic limbo. Not jazz, not blues, not rock. I’ve used the term “transitional artists” (but am open to better suggestions, one that might actually be applied without an explanation) to describe them because that’s what they were. The bridge from one era to another. Joe Lutcher may very well have been the last man to make it over that bridge. If it were a drawbridge that opens in the middle he’d have had to make a leap to get to the other side. But jump he did and as a result here he is, a rocker in the history books. He also gets here for one of the reasons laid out above, namely HIS mindset was as a rocker from the beginning. Even, in a way, before rock itself existed. Joe Lutcher was an interesting figure in music, always floating around the periphery of the history that was being made by those in his general orbit. He was the younger brother of Nellie Lutcher, a much bigger star in her own right at the time, a skilled pianist and hip singer who was too idiosyncratic for jazz and too sophisticated for rock yet who scored repeatedly on the charts around this time with memorable performances, most notably “He’s A Real Gone Guy” which was currently riding high on the Race Charts. Soon after that she released her greatest record, the slinky and suggestive “Fine Brown Frame”, which was equally popular… not to mention far more popular than almost anything rock had to offer at this stage. Her style was utterly unique as she melded exemplary musicianship with tawdry lyrics and deliveries, yet because she too has no genre that she definitively fits into her legacy has been criminally overlooked in the mainstream ever since. As for Joe he had played alto sax with Nat “King” Cole and The Mills Brothers and one would assume that it meant he was destined for a similar pop-shaded musical bag when he signed with Specialty Records early in 1947 to record on his own. In fact that’s apparently what the label wanted too, whether because his sister was scoring with that type of material and they hoped to cash in on that connection or because of Joe’s own background with more “respectable” artists made it seem as if that was his true vocation, or just simply because its owner Art Rupe felt that market was potentially more stable. In any event Joe disagreed and fought to record more uptempo, exciting songs. He didn’t always succeed in those battles. He did however make an early stab at it with a song hinting at the future called Rockin’ Boogie in which he defiantly declares “We’re playing this boogie and we’re playing cuz it rocks!” Yet in June of ’47 maybe the people weren’t ready to rock, or more likely he wasn’t rocking HARD enough to make a dent on their collective consciousness because it sank without a trace. Its relative failure at the time probably confirmed what Rupe had felt about Lutcher’s cockamamie ideas when he tried reining in Joe’s urge to rock in the first place, namely that sailing in these untested waters wasn’t exactly the smartest move commercially. 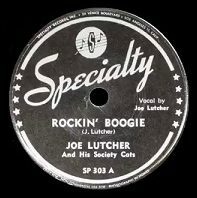 Ironically once rock itself came into being a few months later Lutcher seemed prescient in a way and Rockin’ Boogie began appearing on regional charts, rising high in New Orleans where they were most hospitable to these sounds. As for the song, no it’s not rock, in fact its closer to Louis Jordan in concept, but remember rock ‘n’ roll itself hadn’t been unleashed to the world yet when he’d cut it so all this meant was Lutcher wasn’t going to be the one to do it. But if others did, well then he’d happily jump on board. To that end, feeling stifled by Specialty’s insistence that he give up his dreams of making some rambunctious noise without a proper name yet, he made the move to Capitol Records where his sister Nellie was recording. It’s likely they too envisioned him in a more typical musical motif than what he had in mind but they let him loose in the studio and he came out with Shuffle Woogie, which rests comfortably within rock’s borders… maybe not for long if the music that others were making continued to progress well past this in rapid fashion, but for now it’ll do. Though Shuffle Woogie is an instrumental and thus contains no rallying cries for the music as his earlier effort had it’s definitely more in line with the rock scene that had fully emerged since his Specialty sides were released the previous spring. It starts off well enough as the horns are playing a vibrant intro, sort of a spry grinding riff, but then just as you’re getting into it the trumpet butts in and pulls it back to the past. This stylistic tug-of-war will never be fully resolved and thus accounts for Lutcher’s tenuous citizenship in the land of rock, despite his vows of allegiance to the new country. But when Lutcher jumps into the fray with his sax he states his case effectively. It’s not quite a honking workout, but it’s also not a timid excursion into rock’s established territory before turning back either. He clearly wants to rock, but almost like a little kid afraid to head across the playground to join a crowd of five year olds from another neighborhood, he’s a little tentative. But like most kids once he’s in the sandbox with the rest he gets comfortable and starts acting up. Despite his enthusiasm the whole thing is still a little too tightly structured to really get you moving. That more studious approach, the adherence to tightly written charts, is a holdover from the music that came before this and threatens to deliver a knock-out blow to the song’s chances, especially when the trumpet gets an extended spotlight a minute in. But Lutcher’s not down for the count, he rises to his feet quickly and in boxing terms sticks his jab, keeps moving and manages to land a few solid blows which get a rise out of the crowd. To keep the boxing analogy going, in the final minute they basically just keep their distance, staying on their feet but doing nothing to impress the judges. They may lose the fight by decision but they at least proved they belonged in the ring. While the record’s not going to be mistaken as a true contender for rock’s heavyweight crown it’s certainly not off-putting in any way, even when the trumpeter intrudes a little too much he can’t fully dampen the mood. The riff itself is the star and while it’s not something that’ll set the world on fire it’s catchy enough to stay in your mind after the record ends. At the time of its release Shuffle Woogie fit into the basic framework of rock well-enough, but of course there’d only been a few instrumentals and so the field wasn’t a crowded one as of yet. In time – as those better heeled competitors set the precedent that others would soon follow and take even further – this type of more sedate workout would probably fall well-short of stoking the interest of anybody. But we hadn’t gotten to that point yet and so maybe it’s not surprising that the song DID make the charts for a lone week the next March, giving more notice that there was commercial potential in all of this after all. While he wasn’t on the cutting edge of the new sounds and would struggle to translate his ideas to wax it at least showed that Lutcher’s instincts were right all along in trying to push the boundaries of what was possible. Though history has rarely acknowledged his his tentative forays into something new the fact remains that at the very least Joe Lutcher believed in the concept of all of this before most people were even aware of rock’s existence. In the end he’s at least earned another bout. 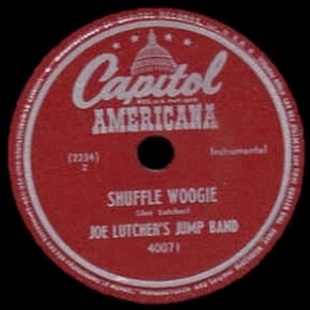 Leave a reply on "Joe Lutcher: “Shuffle Woogie”"